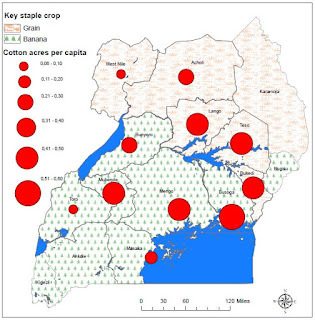 Resource endowments and agricultural commercialization in colonial Africa: Did labour seasonality and food security drive Uganda’s cotton revolution? Agricultural commercialization was a key driver of African economic change during the colonial era. Why did some African smallholders adopt cash crops on a considerable scale, while most others were hesitant to do so? In recent years, debates on the determinants of African development have been dominated by institutional explanations (Acemoglu and Robinson, 2010). However, there is also a current of literature pointing at the importance of ecological factors and resource endowments (Austin, 2008; Tosh, 1980). In this study, we investigate and test the plausible claim that factor endowments crucially shaped the degree to which export crops were adopted by smallholders in colonial tropical Africa. In his seminal contribution, Tosh (1980) made a strong case for a resource endowments perspective on African agricultural commercialization during the colonial era. Tosh argued that different responses of African farmers to export crop cultivation can be explained by the distinction between ‘forest’ and ‘savanna’ areas, in which farmers faced distinct resource endowments. Forest areas have fertile soils and well-distributed rainfall patterns, and are suitable for crops that yield high caloric returns per unit of labour (such as yam, banana) as well as lucrative cash crops (such as coffee and cocoa). Savanna areas, instead, were characterized by a brief growing season during which farmers struggled to secure their subsistence requirements. Not only were labour demands unevenly distributed under such dryer savannah conditions, but farmers also had to rely on drought-resistant but labour intensive grain cultivation, and less lucrative cash crops such as cotton and groundnuts. Consequently, insufficient labour was available to cultivate cash crops without facing food insecurity. We conduct an in-depth case study of the ‘cotton revolution’ in colonial Uganda to put Tosh’ argument to the test. Ugandan smallholders, unlike their counterparts elsewhere in Sub-Saharan Africa, adopted cotton on a substantial scale. Cotton was first exported in the early 1900s, and already by the 1920s, Uganda had become the world’s fourth cotton exporter in per capita terms (and 11th in terms of total production). Two common explanations exist in the literature for the exceptional cotton uptake by Ugandan farmers. Firstly scholars arguing from a resource endowment perspective have argued that the success of cotton in Uganda should be attributed to cultivation of the perennial banana by Uganda’s cotton growers. Bananas yielded high caloric returns to labour and left farmers with sufficient labour to cultivate an inedible and labour intensive export crop (Elliot, 1969; Tosh, 1980). However, as illustrated by Figure 1, bananas were only grown in some parts of Uganda, while smallholders in grain growing regions were equally invested in the cultivation of cotton. In other words, this crop-based version of the resource endowments explanation does not hold up to the historical record. Secondly, scholars taking an institutional perspective have argued that Ugandan cotton adoption was the outcome of particularly effective colonial coercion (Hanson, 2003; Young, 1994). Again, however, the explanation does not hold up to the historical evidence: while the most outright Ugandan colonial coercive policies were scaled back during the 1920s, cotton production in this period accelerated. 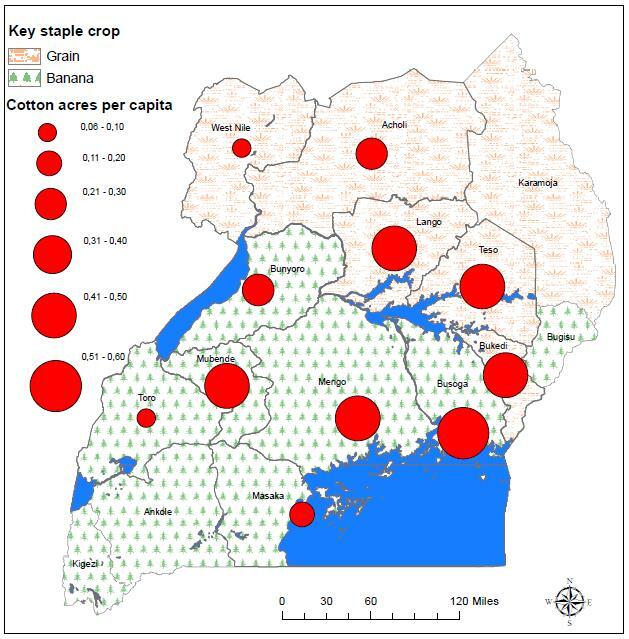 We argue that the previous literature has focused too much on crops and coercion, and has overlooked a crucial environmental condition that characterized all of Uganda’s cotton growing regions, namely its equatorial bimodal rainfall patterns (see Figure 2). Bimodal rainfall – i.e. the occurrence of two distinct rainy season per year – gave smallholders an important edge over their counterparts farming in conditions of unimodal rainfall, and enabled them to cultivate cash crops while retaining food security. The benefits were two-pronged. Firstly, the occurrence of two rainy seasons meant that agricultural labour demands were more smoothly distributed throughout the year, effectively enabling farmers to use more labour to grow crops. Indeed, farmers used the first rainy season to grow food crops, and relegated cotton to the second rainy season. The benefit of spreading out farming operations over two rainy seasons is best illustrated by a comparison between the Teso region of Uganda and northern Côte d’Ivoire (Figure 3). If we assume that the month with the greatest labour input in Figure 3 signifies the potential maximum monthly household labour capacity, this would imply that, because of a more favourable seasonal distribution, farmers in the three Ugandan cases were able to use between 69 and 71 per cent of their annual labour capacity in agriculture, while farmers in Côte d’Ivoire, could only effectively exploit 49 per cent of their labour capacity to produce crops. This gap of just over 20 percentage points may well account for the difference between cotton adoption and rejection. Secondly, having two chances to secure subsistence per year mitigated the impact of a single harvest failure, and allowed farmers to take greater risks, such as devoting one of the rainy seasons to the cultivation of an inedible cash crops. We show that farmers relegated cotton to the second rainy season, and hypothesize that the allocation of labour to cotton depended on the degree of food security achieved in the first rainy season. 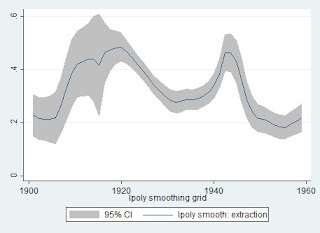 To test this hypothesis, we perform a panel analysis on a newly constructed, strongly balanced, district-level dataset of cotton acres per capita over a 36 year period (1925-1960). Food crop yield data are impossible to obtain in a smallholder economy with very limited administrative capacity. To proxy for food crop harvests in the first rainy season, we look at rainfall deviation. An extensive body of previous research has shown that rainfall deviation is a reliable estimate of harvest outcomes (Papaioannou, 2017; Papaioannou & De Haas, 2017 for further discussion). Usually, studies look at rainfall on an annual basis, but for our analysis and bimodal context, we take rainfall deviation of the first six months of the year – that is before the planting of cotton. Our panel analysis indicates that rainfall deviation in the first season had a negative impact on subsequent cotton cultivation, suggesting that food security trumped cotton cultivation, and that farmers shifting resources from cotton to food during the second reason to compensate for the disappointing food crop harvest. The effect is stable and highly significant (at the 1% confidence level), and holds up to numerous robustness checks. Interestingly, when we do not find heterogeneity between the grain and banana districts, indicating that rainfall patterns rather than farming systems were decisive to smallholders’ willingness and ability to adopt cotton. Our study highlights the importance of food security and labour seasonality as important determinants of agricultural commercialization in colonial tropical Africa. We propose that, in a colonial context, bimodality was a close-to-necessary condition for a ‘cash crop revolution’ to occur. At the same time, we are careful not to argue that cash crop adoption can be understood and explained solely by looking at labour seasonality, or even resource endowments more broadly. In this study, we have treated thin markets for credit and food, and limited adoption of agricultural technologies as exogenously given. In reality, of course, such limitations were an outcome of the policies of colonial governments, which operated on a shoestring and were unwilling to invest to any large extent in the agricultural development of their colonies. That resource endowments mattered so much testifies to the poor institutional context in which famers operated. Acemoglu, D., and J.A. Robinson. 2010. “Why is Africa poor?” Economic History of Developing Regions 25 (1):21-50. Austin, G. 2008. “Resources, techniques, and strategies south of the Sahara: revising the factor endowments perspective on African economic development, 1500-2000.” The Economic History Review 61 (3):587-624. 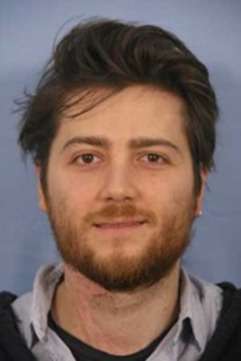 Elliot, C.M. 1969. “Agriculture and economic development in Africa: theory and experience 1880-1914.” In Agrarian change and economic development, edited by E.L. Jones and S.J. Woolf. London: Methuen. Frankema, Ewout, Jeffrey Williamson, and Pieter Woltjer. 2015. An economic rationale for the African scramble: the commercial transition and the commodity price boom of 1845-1885. National Bureau of Economic Research. Papaioannou, Kostadis J. 2017. ““Hunger makes a thief of any man”: Poverty and crime in British colonial Asia.” European Review of Economic History 21 (1):1-28. Papaioannou, Kostadis J., and Michiel de Haas. 2017. “Weather Shocks and Agricultural Commercialization in Colonial Tropical Africa: Did Cash Crops Alleviate Social Distress?” World Development 94:346-365. Tosh, John. 1980. “The cash-crop revolution in tropical Africa: an agricultural reappraisal.” African Affairs 79 (314):79-94. Young, Crawford. 1971. “Agricultural policy in Uganda: capability and choice.” In The state of the nations: constraints on development in independent Africa, edited by M.F. Lofchie, 141-164. How Extractive Was Colonial Trade? Extractive colonial institutions have been considered one of the main causes of current African underdevelopment (Acemoglu, Johnson, and Robinson, 2001; Nunn, 2007). Yet, since colonial extraction is hard to quantify and its precise mechanisms are not well understood, a paucity of research has examined exactly how successful the colonizers were in extracting wealth from Africans. In a new paper, I tackle this issue by focusing on colonial trade in French Africa. The French colonizers, in fact, made great use of trade monopsonies and compulsory harvest quotas to obtain agricultural commodities from African producers at very low prices and resell them in Europe for large profits (Coquery-Vidrovitch, 1972; Suret-Canale, 1971). Given this specific feature of French trade, I argue that it is possible to measure colonial extraction by looking at the gap between the prices that the African producers received and the prices that they should have obtained if colonial trade had been competitive. 1) First, by using a variety of colonial publications, I reconstruct yearly estimates of prices at the French port, African producer prices, and trading costs (including shipping, insurance, inland transportation, port charges, and export taxes) for the main exported commodities between 1900 and 1960. 2) Then, I compute what producer prices should have been in a competitive market as the difference between prices at the French port and trading costs. 3) Finally, I compare actual and competitive producer prices to measure the level of colonial extraction related to export trade. The figure below summarizes the main result of the paper, by showing the average gap between actual and competitive producer prices over time: on average prices to African producers were less than two thirds of what they would have been in a competitive market. actual and competitive producer price. In addition, I employ a two-fold approach to check the robustness of these results. 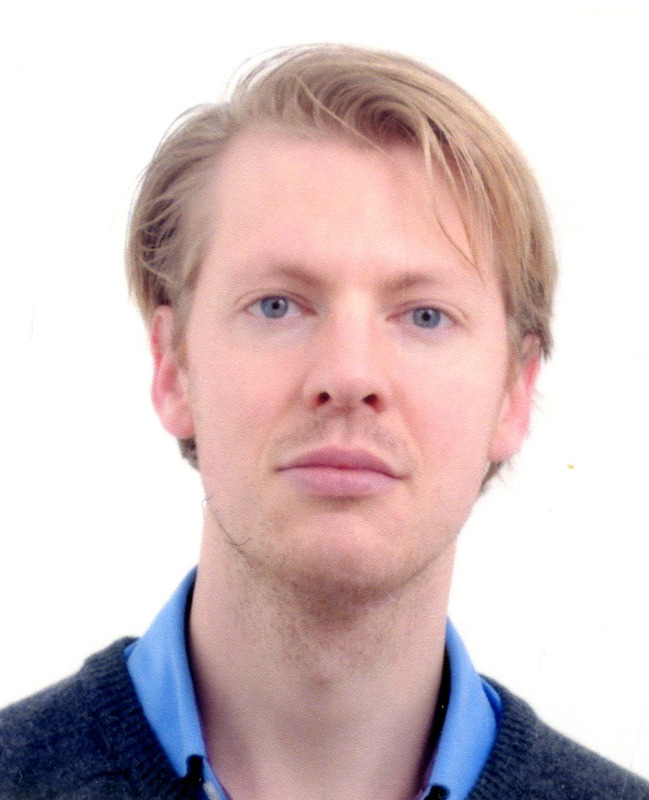 First, I verify that price differentials in French Africa were much larger than the ones that we can observe in other markets not subject to colonial extraction, such as the trade between the United States and the United Kingdom and the trade of commodities produced in Africa by European settlers. Second, I use a regression analysis to take into account unobservable trading costs, such as risk compensation and productivity differences, and to demonstrate that an increase in the world price for a commodity did not generate a proportional increase in the African producer price. Together, the evidence suggests that colonial trade dynamics were characterized by a considerable amount of extraction. Future research aimed at examining whether this had long-lasting consequences on current economic development is warranted. 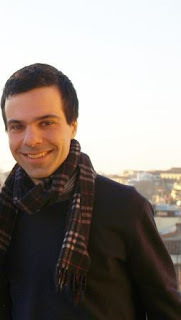 This blog post was written by Federico Tadei, visiting professor at University of Barcelona. The full paper is available at http://www.ehes.org/EHES_109.pdf. D. Acemoglu, S. Johnson, and J. Robinson. The colonial origins of comparative development: An empirical investigation. American Economic Review, 91:1369-1401, 2001. C. Coquery-Vidrovitch. Le Congo au temps des grandes compagnies concessionnaires, 1898-1930. Mouton De Gruyter, 1972. N. Nunn. Historical legacies: A model linking Africa's past to its current underdevelopment. Journal of Development Economics, 83:157-175, 2007. J. Suret-Canale. French colonialism in tropical Africa, 1900-1945. Pica Press, 1971.